RESERVATIONS: Guests may request Online Bookings for this property. All Online Bookings remain subject to review and acceptance by Navarre Vacation Rentals, LLC. PLEASE NOTE: Upon acceptance of an Online Booking, Guests will receive an email from Navarre Vacation Rentals containing the Rental Lease Agreement for this property. All Guests must review, execute and return the last 2 pages of the Lease Agreement along with legally issued photo identification within 72 Hours of establishing a Reservation. Failure to return the executed Lease Agreement within 72 Hours of Booking may result in the Cancellation of a Guest's Reservation and the rental of the property to another Guest. Online Bookings require Full Payment at the time of Booking. Navarre Vacation Rentals, LLC is happy to answer all Guest questions about this property. Navarre Vacation Rentals maintains Operational Business Hours based on seasonal rental demands. OCCUPANCY: Property occupancy standards are mandated by Fire Codes and legal Homeowner directives. The maximum allowed occupancy of Regency 609 permits a maximum of up to 6 persons (including small children and infants). Occupancy standards are defined as being the number of persons permitted to be present inside this property at any given time. The Occupancy of all properties managed by Navarre Vacation Rentals is carefully monitored. Guest violation of the stated occupancy standards may result in Guest removal and forfeiture of payment. AMENITIES: The use of community amenity features (Pool & Workout Room) requires all Guests to have wristband identification visibly displayed. Guest failure to visibly display community identification wristbands may result in Security removing Guests from the facility. A maximum of 6 wristbands will be made available for this property. PETS: Guests are NOT permitted to have pet animals present while in this community. Guest violation will result in the immediate termination of Guest rental and Guest forfeiture of all monies paid. Guest violation of the NO PET policy of this community also remains subject to additional financial charges associated with repairs, replacements or pet remediation efforts (Please see Rental Lease Agreement). Any Fines issued by the Homeowner's Association are deemed as billable charges and will be applied to Guest's Credit Card. This community carefully monitors for the presence of animals. SERVICE ANIMALS: Navarre Vacation Rentals, LLC is committed to assisting all Guests in need of a trained Service Animal. Guests requiring the assistance of a Service Animal are asked to notify Navarre Vacation Rentals of this need at the time of establishing a Reservation. Documentation demonstrating Guests' current medical treatment and a licensed physician's medically prescribed need may be requested in order to provide property Owners and Homeowner Association officials with required documentation to substantiate the legitimate need for the presence of an animal. SMOKING: Smoking is expressly NOT permitted within any interior areas of this property. Guest violation of the NO SMOKING policy will result in the immediate termination of Guest rental and Guest forfeiture of all monies paid. Additional financial charges will be applied to Guest's credit card for needed repairs, replacements or smoke remediation efforts. Minimum periods for rental use of Regency 609 apply and can be found under RATES for this property listing. The Navarre Regency is a 9 Story Community Located Directly On the Beach and Overlooking the Gulf of Mexico. Regency 609 is located on the 6th Floor of this Community. Large Balcony Overlooking the Gulf. Equipped with Bistro Table/Chairs. Thank you for giving us the opportunity to accommodate your recent visit. We appreciate that you took time to leave a review of your rental experience. If we can ever be of help in the future we hope you will reach back out. We had wonderful Christmas get-away! Accommodations were absolutely perfect! Very homey and comfortable! Views from the balcony were spectacular. Loved it! We are delighted to know you enjoyed your Christmas visit! Thank you for sharing your experience with others. If we can ever be of help please reach back out - we would love to have your family as Guests again! Excellent location and view from the 6th floor. One door away from the elevator. Very clean pool. Regency 609 was a great choice in rental for our vacation. Huge condo. Bedrooms and bathrooms are large updated and beautiful. Plenty of towels and the little shampoos and lotion are a nice touch in each bathroom. Furniture is comfortable but getting a bit tired. Recliner has a squeaky noise that woke everyone up when someone used it in the morning. We couldn't really figure out how to use the sleep number bed in the master. I got my side softer then couldn't get it to go back to firmer. Our friends who used the other bedroom said that the beds sagged a little when slept in. Kitchen could use more everyday type glasses and I bought a new coffee filter due to the one in the Mister Coffee maker was extremely old and falling apart. Prior to our arrival I had asked about the condition of the tile floors due to having bad experiences with our feet getting black walking on grimy tile. The floors were clean and we didn't get dirty feet. Yay! The balcony is one of the largest I've seen with a perfect view of the ocean. The balcony furniture was a bit shabby and in need of repair. Overall a great place to stay and we will probably return in the future. Thank you for giving us the opportunity to accommodate your recent visit to Navarre Beach and for taking the time to leave a review of your experience with Navarre Vacation Rentals and Regency #609. I was very surprised when I went to inspect the balcony furniture. I am happy to report the chairs are now at the shop being repaired. I will also be checking the other things you've pointed out. It is difficult to know about some things unless someone staying in the property informs you. We will be addressing all things you've pointed out and appreciate you bringing these matters to our attention. If we might ever be of help in the future please reach back out. We would love to accommodate you and look forward to seeing you again. This condo was super clean and the floor plan is perfect for two couples. The beds were comfy and the view was amazing. We love Navarre! Thank you for letting Navarre Vacation Rentals be a part of your recent visit to Navarre Beach. We are delighted to know you had an enjoyable visit and that Regency 609 provided you with comfortable accommodations. We hope the next time you long to "stick you toes in the sand" you will give us call. We also appreciate that you took time to share your experience with other travelers! The decorating and furnishings were beautiful. The view was fantastic. It was easy to check in and we just needed to pack and leave the amenity keys on the counter for our departure.We really do not have even one little complaint. We would love to visit again and highly recommend this property. 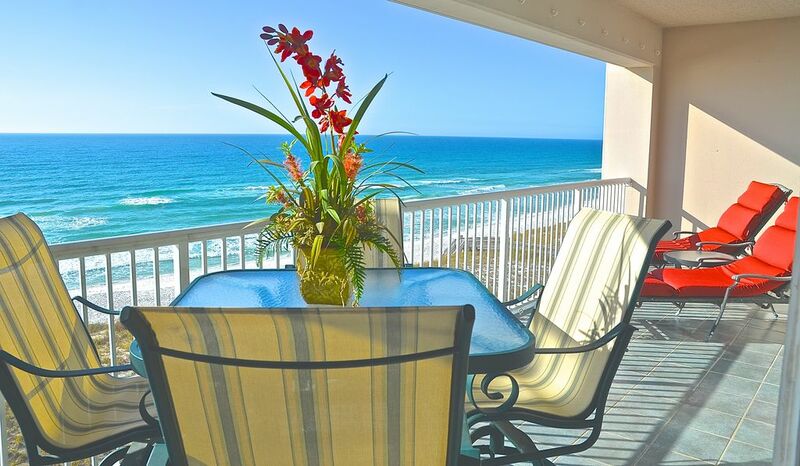 Troy: On behalf of Navarre Vacation Rentals THANK YOU for giving us the opportunity to accommodate your family's recent visit to Navarre Beach in Regency 609. We are delighted to know your family had an enjoyable time. Please reach back out to us if your family ever wants to return - we would love to have you again as our Guests! Very nice location! Comfortable beds and bath! The kitchen was nicely decorated and appointed for meals in. The furniture is getting a bit tired in the family room but was okay as we mostly spent time outside. Main complaint was very poor to no internet service. Would have liked to keep up with social media, newspaper from home and even looking up things to do in Navarre. Thank You for giving Navarre Vacation Rentals the opportunity to accommodate your recent visit to Navarre Beach in Regency #609. We are very sorry for the frustrations you experienced regarding the Internet Service interruption that impacted the entire community. In an effort to enhance the quality of the Internet Service throughout the community the Association recently made the decision to change the service provider. The promised "easy" transition was anything but. As an Owner and resident at the Regency I too was frustrated with this interruption. Fortunately, I happy to report that the transition is now complete and all Guests throughout the Regency should now have high speed internet service that is far superior to what was originally in place. Please know we are very sorry about this frustrating interruption. We hope you will reach back out again the next time you visit Navarre Beach. Maximum Occupancy of Regency 609 may never exceed 6 persons - this includes small children, infants and Guest invitees of the Lessee. Rental Rates, Property Availability and Acceptance of All Online Bookings requires the Confirmed Acceptance of Navarre Vacation Rentals. Accepted Online Bookings are required to remit the last 2 Pages of the Rental Lease Agreement along with a copy of a legally issued photo ID affirming Guest's Age and Permanent Residency within 72 Hours of acceptance of Online Booking. Lessee must Officially Register and Check-In at the Offices of Navarre Vacation Rentals, LLC prior to taking rental possession of the property. Lessee must present legally issued photo ID and major Credit Card at the time of Check-In. Lessee's Credit Card information will remain on file throughout Lessee's rental visit and act in lieu of a collected refundable Damage Deposit. It is mutually agreed and understood that charges for, but not exclusively limited to property repairs or replacements arising from Lessee's rental use of the property and premises, Fines from Lessee's failure to comply with terms of the Rental Lease Agreement or expenses incurred from Lessee's specially ordered services will be applied and satisfied with the Credit Card supplied by Lessee at the time of Check-In. Lessee assumes full responsibility for all members of their party and any invitees of Lessee occasioning the property and premises. Guests are encouraged to purchase Travel Interruption Insurance coverage from a third party licensed Insurance Broker. Guest Cancellation Policy: Notice of 60+ Days Prior to Check-In: 100% Refund Notice of 30+ Days Prior to Check-In: 50% Refund Notice of Less than 30 Days Prior to Check-In: No Refund Guests are encouraged to contact Navarre Vacation Rentals, LLC via the VRBO email portal with any questions prior to establishing a Reservation.